The Archbishop of Winnipeg, Metropolitan Lawrence Huculak, was part of the delegation of five Canadian Catholic bishops that met with a delegation of five Imams that took place last month in Ottawa at the Secretariat of the Canadian Conference of Catholic Bishops. 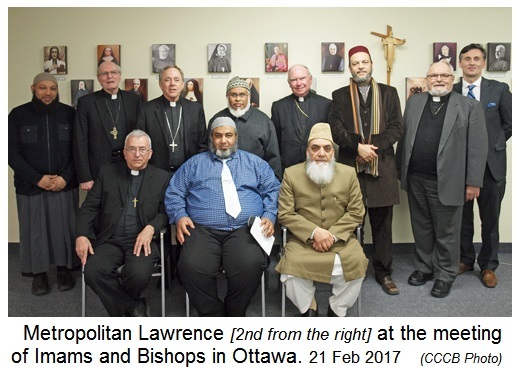 On Tuesday, 14 February 2017, five representatives from the Canadian Council of Imams met in Ottawa with the members of the Episcopal Commission for Christian Unity, Religious Relations with the Jews, and Interfaith Dialogue of the Canadian Conference of Catholic Bishops (CCCB). The five Bishops on the Commission are representative of the ecclesial, linguistic and geographic realities of the Catholic Church in Canada. The Commission is responsible for coordinating the Conference's national ecumenical and interfaith outreach. Currently, the CCCB sponsors eight ecumenical and three interreligious dialogues. The purpose of the meeting involving Imams and Bishops was to bring together religious leadership from the two respective communities in order to discuss the importance of dialogue, reflect on how the two faith communities can be of greater support to each other as faith communities and in service of Canadian society, and to discern possible new avenues for a more formal and concrete relationship between the Council of Imams and the CCCB. The meeting also provided an opportunity for the Bishops to reiterate their condolences and abhorrence following the senseless act of violence at the Islamic Centre in Quebec City in January. Catholic Bishops in Canada already collaborate with the Council of Imams in advocating on important social issues, including opposing the implementation of euthanasia and physician-assisted suicide and promoting good quality and accessible palliative and home care.